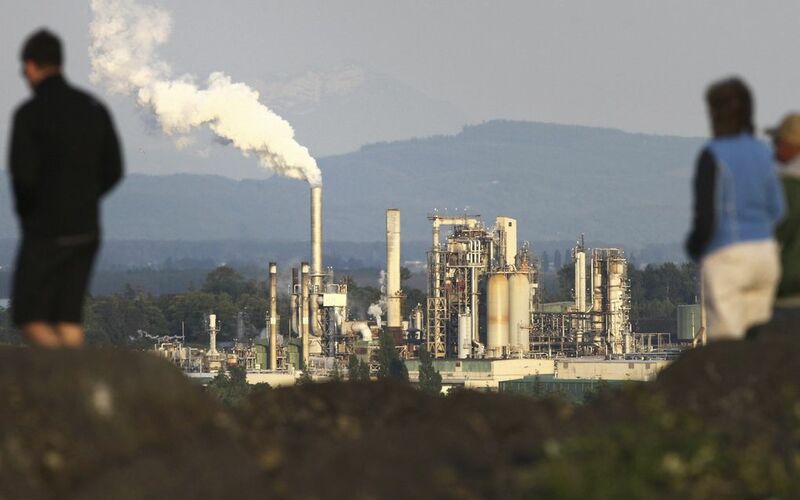 A federal lawsuit filed by the Swinomish Indian tribe seeks to ban BNSF Railway from transporting Bakken crude oil across tribal lands to the Tesoro refinery in Anacortes. The Swinomish Indian Tribal Community on Tuesday went to federal court to block BNSF Railway from sending 100-car oil trains through reservation lands, claiming the company is violating an easement that sharply restricts rail traffic. The easement signed by the railway’s predecessor company in 1991 permits only two trains a day of 25 cars or less from transiting the reservation. It also calls for the railroad company to get permission from the tribe to increase traffic. The lawsuit filed in U.S. District Court in Seattle asks the court to permanently ban the railroad from shipping Bakken shale crude oil across tribal land, asserting that the railroad never sought permission for the oil trains. The Swinomish rail line that traverses tribal land on Fidalgo Island enables trains to reach a Tesoro refinery in nearby Anacortes. The tribal lawsuit is part of an intensifying backlash in Washington and elsewhere in North America against shipping Bakken shale crude from North Dakota and Montana. Production from those fields has surged with the development of new fracking techniques. At Seattle’s Emergency Operations Center on Tuesday, Mayor Ed Murray, King County Executive Dow Constantine and other officials joined U.S. Sen. Maria Cantwell, D-Wash., to discuss threats posed by these accidents. Cantwell introduced legislation last month that would require the federal Transportation Department to regulate the volatility of crude oil shipped by trains. The bill also would increase funding for first responders and require more disclosures from railroads about train routes. The railroads would also have to plan for worst-case derailment scenarios. In Washington last year, up to 19 trains a week crossed parts of the state with crude oil that ends up at state or California refineries. Some of those trains now cross Swinomish lands on the way to the Tesoro refinery. The number of those trains could rise if Shell gets approval for a rail facility at its refinery in Anacortes. As the trains move through tribal lands, they pass close by a casino, a lodge and other development. “Based on the demonstrated hazards” of Bakken shale crude, the tribe is “justifiably and gravely concerned” with the oil shipments, the lawsuit asserts. The railroad’s 1991 easement across the reservation lands resulted from the settlement of an earlier tribal lawsuit that alleged that BNSF’s predecessor company was trespassing on their lands with its trains during most of the past century. The crude-oil shipments across tribal lands began in late 2011, but tribal officials said they were never informed in advance, and have never authorized that train traffic.